In Tony Fletcher’s exhaustive, entertaining biography of The Smiths, singer Steven Patrick Morrissey and guitarist Johnny Marr don’t even meet each other for the first time until page 191, or roughly one-third of the way through the chronologically ordered book. This would seem to go against a common perception that the band (which also included Andy Rourke on bass and Mike Joyce on drums) arrived fully formed, seemingly from out of nowhere in 1983. Although they never hit the Billboard Hot 100 (or reached higher than #8 on the UK singles chart), their cultural influence was massive, arguably defining British guitar pop for an entire generation. That they achieved this in so little time (breaking up in 1987) still astonishes. Despite their brief lifespan, it’s tough to pinpoint a definitive Smiths album—their relatively small discography carries a high concentration of great songs, but rarely do they all appear on the same record together. A decade ago, I would’ve stumped for Best… 1, a 14-track compilation released five years after they broke up simply because it was my introduction to the band and everything on it was aces. However, it leaves off at least a half-dozen of their very best tunes (a few appear on the sequel, …Best 2). You could opt for Singles, which came out a couple of years later, but many Smiths album tracks are as good as their singles (some are actually better)—heck, there’s even a few classic B-sides scattered throughout. One of them, “Half A Person”, features a crystalline melody that could break hearts as effectively as it could sell coffee, with Morrissey checking himself into the YWCA, dutifully asking if they “have a vacancy for a back-scrubber.” It’s easily in my top five Smiths songs. That leaves four studio albums: 1983’s self-titled debut suffers from blah production, much of Meat is Murder (1984) is Morrissey at his most offputtingly didactic (if the title didn’t already tip you off) and Strangeways Here We Come (1987) is tentative and time-biding with Marr already halfway checked out (he left the band right before its release, sealing their demise). All three records have a few great songs, but not as many as the band’s third album. An about-face coming off the heels of Meat Is Murder, The Queen is Dead crucially turns a corner: while Morrissey hasn’t entirely cheered up, his anger here is newly, refreshingly tart, and even the faint suggestion that he’s now comfortable making fun of himself casts these songs in a far different light. The music’s also much more crisp, not only showcasing the rhythm section’s growing proficiency (Rourke’s bass dominates nearly as much as Marr’s guitar) but how tightly the band were functioning as a unit at this time. Perhaps taking a cue from the underground success of “How Soon Is Now” (originally a B-side that was eventually re-released as an A-side, albeit too late for it to become a real hit), the album opens with its title track, a six-minute jam that arrives guns ablaze (but not before beginning with a Morrissey-chosen snippet of the World War I-era “Take Me Back To Dear Old Blighty” from the 1962 film The L-Shaped Room). Of course, this is a daring, loaded title for an album and a song, so one would hope for nothing less than this total rave-up careening with pounding drums, furious wah-wah guitar and one of Morrissey’s acidic, first-person narratives where he rhymes “apron” with “castration”, among other clever turns-of-phrase. “Frankly Mr. Shankly” is just as much a manifesto, but with a tighter structure and lighter spirit. The song’s very English music-hall beat is a perfect match for Morrissey’s ironic (or not?) yearning to “go down in musical history” and his rather affecting disaffected sneer about “making Christmas cards for the mentally ILLLL.” Oh, and it’s actually a swipe at their indie record label, somewhat explaining the certainly ironic “give us yer money” ad-libbed at the end. “I Know It’s Over” is the album’s requisite big melodramatic ballad. With a heavier hand, it could’ve ended up a warped take on your average 1950s/60s heartbroken lament, but the understated, gently layered arrangement avoids any hint of dirge or detachment, the music continually building, retaining all urgency even with Morrissey excessively moaning at the outro. “Never Had No One Ever” suffers a little from sounding like the previous song’s coda—whether it works in sequence or would’ve benefited from isolation depends on how much misery one can withstand in a single listen. Fortunately, “Cemetry Gates” follows with its pleasant, pastoral strum, practically inventing The Sundays. “A dreaded sunny day,” Morrissey sings as if he were a character in a Hitchcock film full of deceptive blue skies, cheerfully name-dropping literary heroes (Keats, Yeats and of course Wilde) in a potentially sullen setting, gently satirizing and celebrating goths and literary geeks alike. Most of The Queen Is Dead’s best-known songs are on its second half. Along with its mocking title and sped-up backing chipmunk vocals on the chorus, “Bigmouth Strikes Again” has Morrissey’s boldest, funniest and most self-deprecating lyrics to date, referencing Joan of Arc, a Walkman and a hearing aid (the latter a typically daft onstage Morrissey prop). It’s all over a relentlessly-paced minor key strum teeming with rapid bursts of guitar and an exhilarating drum break—if they were so inclined, the band could’ve easily remixed it into a New Order-like dance hit. Released as a stand-alone single the previous year, “The Boy With The Thorn In His Side” fits in effortlessly here. Despite the song’s brilliant title, innate lushness and Marr’s beguiling highlife-style guitar lines, the best thing about it may be Morrissey’s wordless vocals throughout the final minute or so, proof of his actual range and improvisational prowess. “Vicar In A Tutu” is not quite as sublime. More or less a rockabilly retread of “Frankly Mr. Shankly”, it feels like a case of “the title begat the song”, but what a title, and what fun that Morrissey actually defends the fancily frocked man of God rather than fully mock or belittle him. But then, after “Vicar In A Tutu” abruptly ends, that sudden, thrilling chord comes crashing in, announcing the most beautiful and affecting song in the band’s catalog. I once said that I could write a whole book about “There Is A Light That Never Goes Out” and I’m only exaggerating slightly. Each time I listen to it, I hear more in it, although it’s not so much due to a dense arrangement (it’s actually pretty straightforward) or any hidden subtext. Apart from setting exceptionally morbid lyrics (“If a double-decker bus crashes into us / to die by your side, such a heavenly way to die”) against a wistful yet ebullient melody, the song doesn’t do anything radically different from any other beloved pop standard. And yet, each time I can discern a little more sweetness, serenity and profundity in it. Consider the way Morrissey sings the key line, “Take me out… tonight,” and all the possible intentions his tone and that significant pause suggest: he’s pleading and yearning, but also resolute and almost melancholy, as if he knows both how ridiculous and vital it is to hope for something, perhaps to be loved or adored or even considered. Near the song’s end, he repeats a variation on its title (“There is a light / and it never goes out”) in almost a singsong cadence to the point where it becomes a mantra, gradually fading away into the sumptuous accompaniment of purposely florid fake strings that are nonetheless tinged with sadness and wonder. It’s an impossible song to top, so rather than even try, The Smiths conclude the album with a joke, albeit a droll one. Musically, “Some Girls Are Bigger Than Others” is nearly as striking as the preceding track with its robust swirl of Rickenbacker guitars circling over a danceable rhythm that all unexpectedly fades out, then back in again. The lyrics are another matter, consisting of not much more than the title, which Morrissey intones as if the thought just came into his head, albeit with a slight roll of the eye more than a Zen koan’s gravitas. Leave it to these guys to leave us on such a sublime, catchy yet purposely silly note. 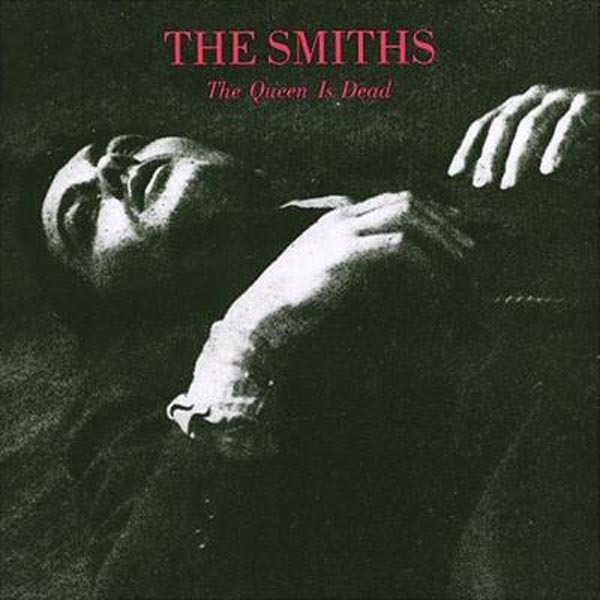 Like the rest of the best of The Smiths, The Queen Is Dead endures due to this alchemy, spinning gold out of so many disparate parts no one previously thought to assemble this way. Up next: more mid-80s British guitar pop.